Reasoning: With a clean sheet and a MOTM performance in a big 1-0 result against Lazio, there is a good chance Reina makes TOTW 31. As he is one of the cheapest 83s, he is a safe look. In addition, there is a good chance that we get a guaranteed, repeatable SBC this Friday for TOTT that causes 83s to rise as a whole; Reina knocks out 2 birds with 1 stone in that sense. What about Debuchy? He is necessary for St. Etienne sbc. He is pretty good – fullbacks tend to rise nicely. It depends on SBC requirements, but if 83s are necessary then they tend to offer a better ROI. Most of the investments I typically target are heavily inflated. I wouldn’t say I’m confident with anyone. Buy Reina at 1300k still good? Get him for as close to my recommended price as possible. Hey Chief, when is the best time to sell these? Since you said a drop in price will be expected next week with the upcoming TOTS? The tweet was in regards to expensive players, not SBC investments that are the cheapest for their respective ratings. Hi chief, hope u re doing good! I would go MOTM Laporte as he is looking pretty low and will likely go extinct after MOTM. The next more expensive investment I’ll be posting will be someone in TOTW 31. That likely won’t be coming until this weekend due to TOTT; there will be a lot of packs opened for that, and I wouldn’t invest until they dip for that. I think Thursday/Friday before the TOTT drops would be a good time to sell players. Given how close we are to TOTS, it could be different situation. Probably less likely that we see a rebound. 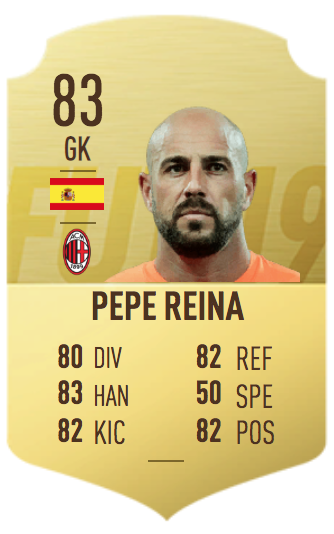 Hello, can someone explain to me why should we invest in this gold pepe reina? If a TOTW pepe reina comes out what we gain with that? Im kinda new to this trade world. Because he wont be in packs. Also as there is an sbc coming soon that requires 83 rated players, his Gold card will be bought because he has good links and wont be in packs throughout the week therefore making him scarce. When a card is in TOTW his normal card is out of packs for a week. So will be lower supply of his normal card, 83. As supply lowers, and demand increase ( SBCs which need him) , then his price can only go up. No investments is guaranteed, but that is the reason why Chief has this as recommended investment. Might be a stupid question, Chief, but do low-rated IFs from previous weeks (Bizot, Gurtner, etc.) crash when a guaranteed TOTW SBC drops, since overall supply of IFs shoots way up? Or does only the current TOTW take major damage? Not really – usually they keep there value due to such limited supply and market circulation. Wait until the weekend at least. It depends on SBCs. If we get a desirable guaranteed SBC this weekend, 83s will rise more than if not. Hopefully he could get to the 2-2.5k range. In your Reasoning why to buy Pepe you explain that all 83s will increase in price this friday. Is that all 83s? Will it affect 84s? It depends on SBC requirements. Yes, it would likely effect 84s too if 83s are required. But you said that the TOTT will make 83s rise as a whole? It’s all speculative. I’m guessing we will get some kind of guaranteed SBC this weekend. There are no guarantees. If we do, it’d make 83s rise. should we sell hugo mallo? Sell when you are happy with the profit and/or see a better investing opportunity. He will increase gradually with time. It depends on SBCs. If the right ones hit, hopefully 2-2.5k.